SpaceX is nothing if not audacious. The company was formed in 2002 by internet entrepreneur and space enthusiast Elon Musk. Although Musk's long-term business goal was to colonize Mars, he chose an easier (!) near-term goal: disrupt the satellite-launching industry. Traditionally dominated by large aerospace firms funded by equally large government contacts, this was something many companies before his had tried and failed. Rocket science is hard, especially when you're starting from scratch. The first three rockets SpaceX launched failed spectacularly, as rockets often do. But failure is the best teacher, and each successive launch made it a bit further downrange. Rocket science is also expensive, and having burned through almost $200M in capital, Musk notes that if the fourth launch had failed he would have thrown in the towel. Fortunately the fourth Falcon 1 reached orbit --- the first privately built ground-launched vehicle to do so. Since then all SpaceX mission patches have included the four-leaf clover that someone had, perhaps in a bit of desperation, added before that launch. SpaceX would launch only one more Falcon 1 before deciding to jump directly to a much more powerful vehicle, the Falcon 9, with the even more audacious goal of recovering spent rockets for reuse. Rockets are hand-built skyscrapers of exquisite precision, and the fact that they were traditionally discarded with each launch is what made spaceflight so expensive. Musk realized early on that it cost $50 million to build a Falcon 9, but only a few hundred thousand dollars to refuel it. If SpaceX could recover and refurbish the boosters, they would revolutionize the industry. But turning an 18-story-tall rocket going 7500kph around and descending from 100km to a soft landing is no easy feat. SpaceX took an evolutionary approach to developing this capability, quietly performing re-entry and steering tests during commercial flights after the boosters were discarded, working on ways to manage sloshing fuel to prevent the engines from sucking air, practicing soft "landings" in the open ocean before attempting to land on a ship, etc. Every experiment and attempt, even if it were a failure, provided valuable knowledge that moved them closer to their goal. Eight years later, despite occasional setbacks, SpaceX is regularly launching, landing and reusing first stages on commercial and government flights, with a success rate that is almost boring. All of that's about to change. 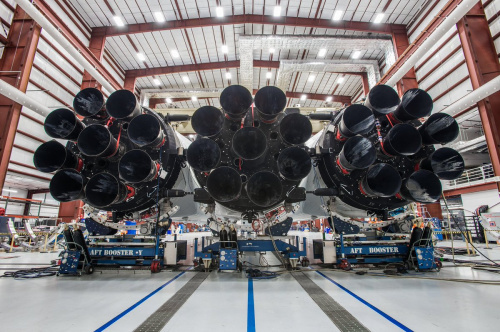 Even while they were perfecting the Falcon 9, SpaceX was working on their next rocket, and now their first super-heavy-lift vehicle is almost ready for its debut. 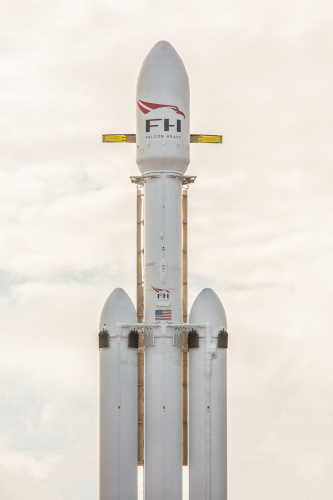 The easy way to describe the Falcon Heavy is to say that it's three Falcon 9s strapped together, but that belies the sheer complexity of this vehicle. "It actually ended up being way harder to do Falcon Heavy than we thought," states Musk. "Really way, way more difficult than we originally thought. We were pretty naive about that." 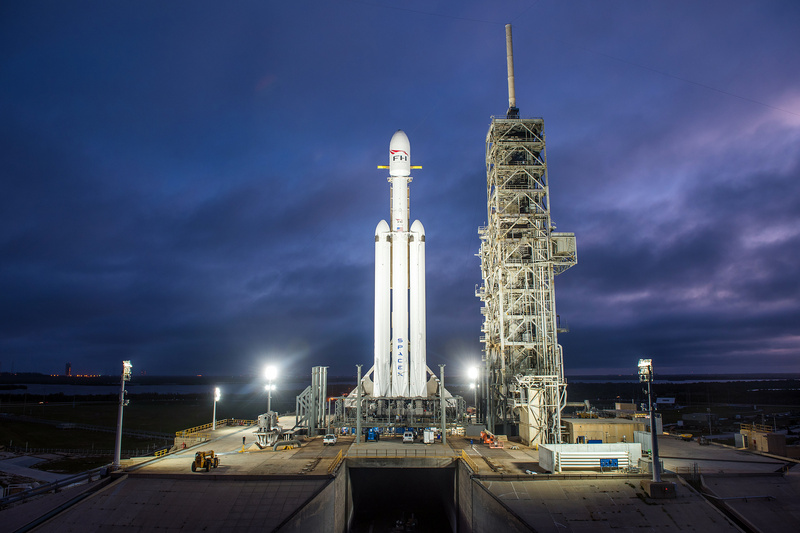 Nicknamed "The Beast" by COO Gwynne Shotwell, the Falcon Heavy will be the most powerful rocket currently operating by a factor of two. Fully fueled, it weighs more than 1.4 million kilograms. It will be capable of putting 64,000 kilograms into Low-Earth Orbit (for reference, the entire ISS weighs a bit over 400,000 kilograms), 27,000 kilograms into Geosynchronous-Transfer Orbit, 17,000 kilograms into Mars-Transfer Orbit --- or sending 3500 kilograms to Pluto (seven times the mass of the New Horizons spacecraft). It has a total of 27 first-stage engines generating over 5 million pounds of thrust at liftoff. It's been designed from the ground up to be human-rated ("a mountain of paperwork," says Musk). 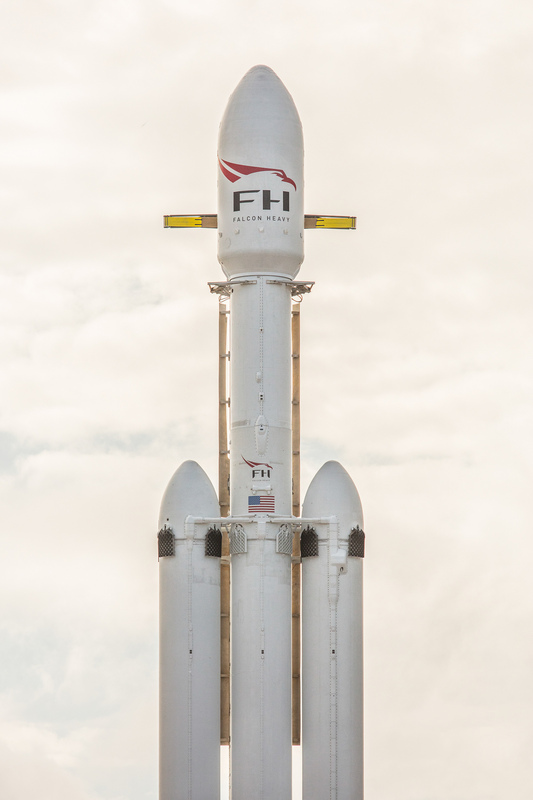 And amazingly, SpaceX plans on recovering all three of the Falcon Heavy's boosters. The two outboard rockets will return to the launch site and land side-by-side on solid ground. And after burning a bit longer, the center booster will land on SpaceX's "Autonomous Drone Ship" 200 miles out to sea; a ballet of epic and explosive proportions. As SpaceX learned from the Falcon 1 days, the first time you fly a new rocket, you quickly begin learning the things you didn't know you didn't know --- or, as they're called in the industry, "unknown unknowns." Since this often results in the complete loss of the vehicle (not to mention everything in the vicinity), SpaceX is understandably taking things slowly. For the past month they've been proceeding through ground tests: rolling out and erecting the unfueled vehicle on the pad to test the ground-support equipment, and filling and draining the fuel tanks with kerosene and supercooled liquid oxygen, known as a "wet dress rehearsal." The last big test will be the "static fire" or "hotfire" test, where all 27 engines are briefly ignited while the rocket is (hopefully) securely bolted to the pad. (SpaceX engineers are still working out the details of staggering the ignition times to avoid breaking the hold-down hardware.) Assuming the vehicle isn't destroyed in the process, this will (hopefully) provide the final data proving that the beast is ready for flight. At the same time, there's only so much testing and analysis you can do on the ground, and SpaceX has a reputation for being careful, but not too careful. Musk himself is pessimistic about the chances of a flawless first flight. "There's a real good chance the vehicle won't make it to orbit. I hope it makes it far enough away from the pad that it does not cause pad damage. I would consider even that a win, to be honest." * UPDATE: SpaceX indeed hotfired the Falcon Heavy this morning, with Musk adding that they'll "launch in a week or so." As if all this isn't enough, to permanently establish Musk's reputation for being larger than life to Bond supervillain levels, the sole payload on the first flight will be Musk's personal cherry-red Tesla sports car. This was assumed to be one of Musks's well-known jokes, until photos emerged of the car actually being encapsulated in the rocket's fairing. Assuming the launch goes better than he thinks it will, the flight plan is to depart Earth and release the car into a Mars-transfer orbit. Mars won't be in the right place at the right time for the car to actually get there (no doubt to the relief of NASA's Planetary Protection Office, which doesn't like anyone spreading Earth germs around the solar system), so the car will circle the sun for potentially billions of years. Or at least until someone, more than likely one of Musk's descendants, recovers it and puts it in the Smithsonian Air and Space Museum. So get your popcorn and livestreams ready. But remember that no matter what happens during this first launch, SpaceX will learn valuable lessons, try again (and again if necessary), get things working and commence normal business operations. It's been said that the two keys to success in the space industry are money and persistence; Musk clearly has both. SpaceX already has three customers lined up for future Falcon Heavy launches (currently $90M if you're interested), and they're working on additional launch facilities on the west coast and in Texas. And even while they're busy getting the Falcon Heavy functional, SpaceX is working on their next rocket --- one that will dwarf even the Heavy, and is being designed specifically to support Mars colonization. This may seem wildly unrealistic now, but that's what people said when the first Falcon 1 rolled out back in 2006. No, no, no. Give me the Tesla and you can send my 15 year old minivan into space! 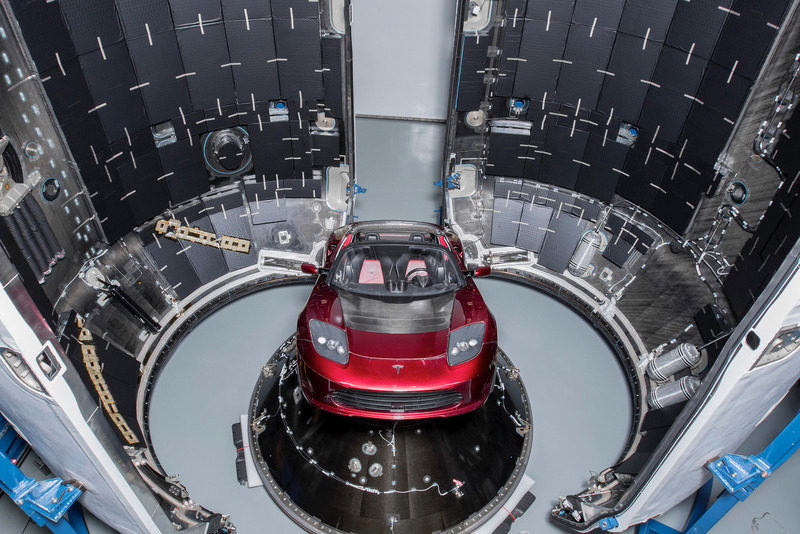 As a Sparkfun customer, I think what they are doing there in Colorado is every bit as exciting as what Spacex is doing, as well as being arguably more beneficial to humanity. These guys are helping to educate the engineers of tomorrow. They are also putting tech in the hands of everyday people. If there is anything that has the potential to level the playing field between big corporations and the average consumer, companies like Sparkfun are it. I would imagine and hope the employees at Sparkfun realize the good that is being done and should be proud to work there. Just my couple of cents worth. I can't speak for everyone here, but I'm thrilled to be working at SparkFun. I'll also just leave this here: I know a number of people who work at the Jet Propulsion Laboratory on the forefront of space exploration. When I told them I started working at SparkFun, they were incredibly excited for me, which blew me away. Hm... $90M to put 142,000 lbs into LEO. That's about $664/lb. IIRC, NASA figures about $10K/lb. That's a BIG difference! I think he should put the top up and roll up the windows. Unless they were removed to keep the weight down. I don't think the weight of the roadster will be a problem for this rocket. ;) In fact the car is so far below the advertised capacity, it's probably going to have to throttle way back to keep the car from leaving the solar system entirely. Don't you think it's time we join the rest of the world in adopting the International System of Units? The United States is the ONLY western country to NOT use it, and we are in the company of Burma and Liberia as the only countries who have NOT standardized on SI. Not company we should be proud of. I'm in my 40s, and I learned this stuff when I was a kid because we were told that by the end of the 1970s we would convert to the SI/metric system. That didn't happen. We, as citizens, can change this by first learning how to do the conversion in our heads, which will lead to understanding the system a lot more. Then we can intelligently start speaking it with others. It's time get with the rest of the world on this one. It starts with us and our willingness to change. In the context of space travel and rockets, our refusal to adopt the metric system has already cost us over $300M USD when we lost the Mars Climate Orbiter in 1999. America, wake up! Let's focus on education instead of entertainment so we can take back our place in the world as the greatest thinkers of the age! I am proud to see Musk, someone who chose to be an American, leading the way. Let us all lead by his example. This post got me so psyched for launch!!! Fully fueled, it weighs [almost] [3.1 million pounds]. It will be capable of putting [142,000 pounds] into Low-Earth Orbit (for reference, the entire ISS weighs [about] [882,000 pounds]), [59,500 pounds] into Geosynchronous-Transfer Orbit, [37,500 pounds] into Mars-Transfer Orbit â or sending [7700 pounds] to Pluto (seven times the mass of the New Horizons spacecraft). It has a total of 27 first-stage engines generating over 5 million pounds of thrust at liftoff. Thanks for doing that. :) Aerospace engineering is an interesting mix of English and metric units; typically (but not always) metric for flight and astrodynamics parameters, and English for machining. When the two are mixed, you need to be very careful. I recall someone asking Musk himself why everything at SpaceX wasn't done in metric, and he replied that because many of the large machine tools they use are antiques (so were built to English standards) and last forever, it wouldn't be cost-effective to replace or modify them. "...disrupt the satellite-launching industry. Traditionally dominated by large aerospace firms funded by equally large government contacts..."
That's funny. SpaceX is currently competing against a company called Orbital to provide cargo to the ISS. Orbital is neither a huge company and many if not most of its contracts are commercial. I wouldn't say "competing against," since Orbital and SpaceX were both awarded ISS Commercial Cargo contracts by NASA, that they are both actively fulfilling. But you're correct in that Orbital Sciences (now Orbital ATK) was the only other small company to successfully challenge the US satellite launching industry, which had been dominated by large defense contractors since the dawn of the space age. Orbital's air-launched Pegasus rocket was the first privately-funded rocket to reach orbit (in 1990), which is why I said that SpaceX's Falcon 1 was the first privately-funded ground-launched rocket to reach orbit (in 2006). The differences are the growth in launch cadence SpaceX is currently achieving, and the reusability factor, which may allow Musk to reach his stated goal of reducing the cost of spaceflight by 10X or more.